King Pōmare V cedes a 403-square-mile island in the remote South Pacific to France as he abdicates his throne under pressure from his chiefs. Tahiti will be the crown jewel of French Polynesia, but indigenous Tahitians will have to wait until 1946 for full French citizenship. Tahiti is the largest island in the Windward group of French Polynesia; this overseas collectivity of the French Republic is sometimes referred to as a French overseas country. The island is located in the archipelago of the Society Islands in the central Southern Pacific Ocean, and is divided into two parts: The bigger, northwestern part Tahiti Nui and the smaller, southeastern part Tahiti Iti. The island was formed from volcanic activity and is high and mountainous with surrounding coral reefs. The population is 183,645 inhabitants, making it the most populous island of French Polynesia and accounting for 68.5 percent of its total population. A clash between General Leslie Groves and physicist J. Robert Oppenheimer threatens to derail a top-secret American military project in the New Mexico desert, and President Franklin Roosevelt intervenes with a letter of heartfelt support written to get the Manhattan Project back on track. The Manhattan Project was a research and development undertaking during World War II that produced the first nuclear weapons. It was led by the United States with the support of the United Kingdom and Canada. From 1942 to 1946, the project was under the direction of Major General Leslie Groves of the U.S. Army Corps of Engineers. Nuclear physicist J. Robert Oppenheimer was the director of the Los Alamos Laboratory that designed the actual bombs. The Army component of the project was designated the Manhattan District; “Manhattan” gradually superseded the official codename, Development of Substitute Materials, for the entire project. Along the way, the project absorbed its earlier British counterpart, Tube Alloys. The Manhattan Project began modestly in 1939, but grew to employ more than 130,000 people and cost nearly US $2 billion (about $27 billion in 2016 dollars). Over 90% of the cost was for building factories and to produce fissile material, with less than 10% for development and production of the weapons. Research and production took place at more than 30 sites across the United States, the United Kingdom, and Canada. Two types of atomic bombs were developed concurrently during the war: a relatively simple gun-type fission weapon and a more complex implosion-type nuclear weapon. The Thin Man gun-type design proved impractical to use with plutonium so a simpler gun-type called Little Boy was developed that used uranium-235, an isotope that makes up only 0.7 percent of natural uranium. Chemically identical to the most common isotope, uranium-238, and with almost the same mass, it proved difficult to separate the two. Three methods were employed for uranium enrichment: electromagnetic, gaseous and thermal. Most of this work was performed at the Clinton Engineer Works at Oak Ridge, Tennessee. In parallel with the work on uranium was an effort to produce plutonium. After the feasibility of the world’s first artificial nuclear reactor was demonstrated in Chicago at the Metallurgical Laboratory, it designed the X-10 Graphite Reactor at Oak Ridge and the production reactors in Hanford, Washington, in which uranium was irradiated and transmuted into plutonium. The plutonium was then chemically separated from the uranium. The Fat Man implosion-type weapon was developed in a concerted design and development effort by the Los Alamos Laboratory. The project was also charged with gathering intelligence on the German nuclear weapon project. Through Operation Alsos, Manhattan Project personnel served in Europe, sometimes behind enemy lines, where they gathered nuclear materials and documents, and rounded up German scientists. Despite the Manhattan Project’s tight security, Soviet atomic spies still penetrated the program. 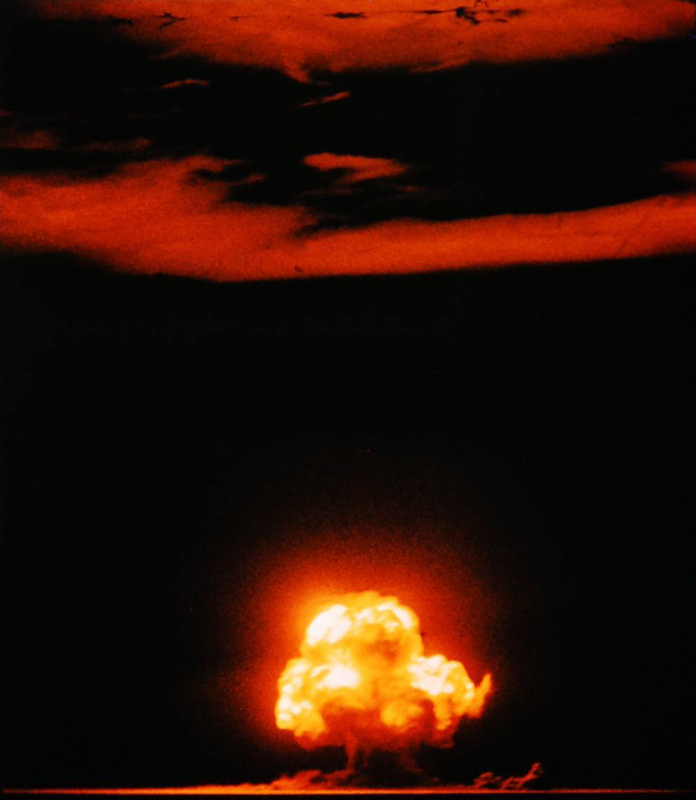 The first nuclear device ever detonated was an implosion-type bomb at the Trinity test, conducted at New Mexico’s Alamogordo Bombing and Gunnery Range on 16 July 1945. Little Boy and Fat Man bombs were used a month later in the atomic bombings of Hiroshima and Nagasaki, respectively. In the immediate postwar years, the Manhattan Project conducted weapons testing at Bikini Atoll as part of Operation Crossroads, developed new weapons, promoted the development of the network of national laboratories, supported medical research into radiology and laid the foundations for the nuclear navy. It maintained control over American atomic weapons research and production until the formation of the United States Atomic Energy Commission in January 1947. A salacious trial in England wraps up after a drug bust at Rolling Stones guitarist Keith Richard’s home. No “indian hemp” was actually found, and singer Mick Jagger had only four amphetamine pills, but they’re both convicted and sentenced to prison, Jagger for three months and Richards a year. They’ll spend just two days in prison before the convictions are thrown out. For the first time in history a US space shuttle docks with a Russian space station, as Atlantis shuttle commander Robert ‘Hoot’ Gibson pilots his craft at 17,500 mph to dock with the massive Mir space station. Their meeting creates the largest manmade object ever to orbit the earth. The project, sometimes called “Phase One”, was intended to allow the United States to learn from Russian experience with long-duration spaceflight and to foster a spirit of cooperation between the two nations and their space agencies, the US National Aeronautics and Space Administration (NASA) and the Russian Federal Space Agency (Roskosmos). The project helped to prepare the way for further cooperative space ventures; specifically, “Phase Two” of the joint project, the construction of the International Space Station (ISS). The program was announced in 1993, the first mission started in 1994 and the project continued until its scheduled completion in 1998. Eleven Space Shuttle missions, a joint Soyuz flight and almost 1000 cumulative days in space for American astronauts occurred over the course of seven long-duration expeditions.